This week we were lucky to chat with the beautiful Annie Tarasova & ask a few questions about her inspiring artwork, lifestyle & outlook on this beautiful world! Annie has had a love for painting & drawing from a young age constantly being inspired by our Universe – the stars, planets, flowers, crystals & plants. She decided to spill all her thoughts and feelings on paper in the form of ink and watercolour resulting in some of the most awe-inspiring artwork we have ever laid our eyes on. In May 2016 Annie then opened her Esty store DreamyMoons & has never looked back since! Annie: Warm sunshine, puppies, hugs, getting into my bed right after I change the sheets, silly TV shows, letters, spring flowers, floating on my back in the ocean on a hot hot summer day. 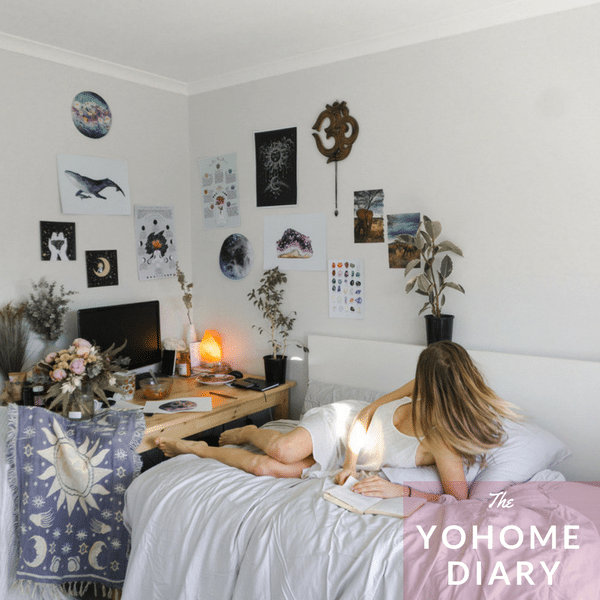 YoHome: Your best inner beauty tip? YoHome: How do you cope with obstacles and frustrations in your everyday life? Annie: I understand that there are no obstacles. To me, everything is a learning experience which happens for a reason. So I appreciate every experience that comes my way. It is all just an opportunity to grow and learn. Annie: Anything by Eckhard Tolle… I love his books. Current favourite – Life will give you whatever experience is most helpful for the evolution of your consciousness. How do you know this is the experience you need? Because this is the experience you are having at this moment. Even though that is not an item – but my dog. I am yet to come to terms with the fact that dogs don’t live forever! Annie: It’s probably a quality that most people hate about themselves – but I love the fact that I am stubborn. I love it because it helped me to get where I am now and I know it will help me get anywhere I wish to be. I’ve been told a lot, mostly from family members, about what I should do with my life and what direction I should go into. However I am happy that, being as stubborn as I am, I only listen to what my heart tells me. I am a Taurus and that’s a typical Taurus quality – although, that is the ONLY Taurus quality that applies to me! Annie: Warmth, yummy food, cosy bed, people I love, feeling safe and nurtured. YoHome: It looks like so much love and time goes into every piece of artwork you create, what inspired you to start creating? Annie: I have been painting and drawing since I was a kid. Computers, phones and internet just wasn’t a thing when I was little. I spent my childhood exploring, reading and painting. To me art is an important and natural part of my life. What inspires my art now is my fascination with the Universe, stars, planets, nature and our connection with everything that surrounds us. YoHome: We are so intrigued by creative peoples home and work spaces, where do you do most of your painting? Annie: I travel heaps. But even though I always take my art supplies with me, I never find the time to sit down and paint. What I always look forward to when I come home is lighting a candle or incense in my bedroom, playing some music, and painting on the floor. YoHome: How did DreamyMoons come into fruition? Annie: After high school my initial plan was always to study design. However in my last year of school I became interested in holistic health and nutrition and last minute changed my mind and went to study naturopathy (holistic health science) instead. It was amazing. However after months of having no free time to paint and explore my creative side, I felt like there was something missing. Around May 2016, I had a few days off. I painted non stop. I never thought I would open an Etsy shop and it wasn’t something that I really planned through. I just thought – why not. Etsy will motivate me to paint more, I’ll get to share my art with others, and earn a bit of money in the process (with Uni I didn’t have time to have a part time job!). Having your own business definitely gives you more freedom and flexibility when you’re studying full time. After a year on Etsy I felt my passion for art take over my passion for health. With Etsy and painting days on end, I felt like I was doing what I was always supposed to. I took a 6 month break from Uni and never went back. Doing what I do now, I feel a sense of alignment that I never felt before. Annie: Overflowing with happiness, pursuing my passion further and further, learning and growing. A massive thank you must go to Annie for taking the time to chat to us & giving us a sneak peek into her inspirational mind! Be sure to check us out on social media & keep an eye out for more interviews like this in the near future!